A sacrificial tripod is a three-legged piece of religious furniture used for offerings or other ritual procedures. As a seat or stand, the tripod is the most stable furniture construction for uneven ground, hence its use is universal and ancient. It is particularly associated with Apollo and the Delphic oracle in ancient Greece, and the word "tripod" comes from the Greek meaning "three-footed". A ding from the late Shang Dynasty. 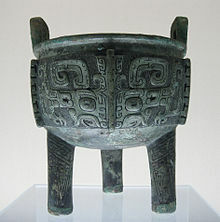 Tripod pottery have been part of the archaeological assemblage in China since the earliest Neolithic cultures of Cishan and Peiligang in the 7th and 8th millennium BC. Sacrificial tripods were also found in use in ancient China usually cast in bronze but sometimes appearing in ceramic form. They are often referred to as "dings" and usually have three legs, but in some usages have four legs. The Chinese use sacrificial tripods in modern times, such as in 2005, when a "National Unity Tripod" made of bronze was presented by the central Chinese government to the government of northwest China's Xinjiang Uygur Autonomous Region to mark its fiftieth birthday. It was described as a traditional Chinese sacrificial vessel symbolizing unity. The most famous tripod of ancient Greece was the Delphic Tripod from which the Pythian priestess took her seat to deliver the oracles of the deity. The seat was formed by a circular slab on the top of the tripod, on which a branch of laurel was deposited when it was unoccupied by the priestess. In this sense, by classical times the tripod was sacred to Apollo. According to the myth, Hercules (?) went to the oracle of Delphi in order to ask what to do in order to be expiated from the murder of Iphitos. The oracle did not want to give him an omen. The enraged hero then grabbed the tripod on which the Pythia sat in order to pronounce her oracles. Apollo tried to prevent him and this resulted in a fight between the god and the hero. Finally, Zeus had to intervene in order to end this quarrel. The mytheme of Heracles contesting with Apollo for the tripod appears in vase-paintings older than the oldest written literature. The oracle originally may have been related to the primal deity, the Earth. In the Geometric period, the tripods were fastened to the cauldrons they supported. In the Museum of Delphi there are fragments of such tripods, most distinctive of which is the one with a ring-shaped handle. Another well-known tripod in Delphi was the Plataean Tripod; it was made from a tenth part of the spoils taken from the Persian army after the Battle of Plataea. This consisted of a golden basin, supported by a bronze serpent with three heads (or three serpents intertwined), with a list of the states that had taken part in the war inscribed on the coils of the serpent. The golden bowl was carried off by the Phocians during the Third Sacred War (356–346 BC); the stand was removed by the emperor Constantine to Constantinople in 324, where in modern Istanbul it still can be seen in the hippodrome, the Atmeydanı, although in damaged condition: the heads of the serpents have disappeared, however one is now on display at the nearby Istanbul Archaeology Museums. The inscription, however, has been restored almost entirely. Such tripods usually had three ears (rings which served as handles) and frequently had a central upright as support in addition to the three legs. Tripods frequently are mentioned by Homer as prizes in athletic games and as complimentary gifts; in later times, highly decorated and bearing inscriptions, they served the same purpose. They appear also to be precious gifts for the guests, as in the case of the Phaeakes, who offered a cauldron and tripod to Odysseus. Our guest has already packed up the clothes, wrought gold, and other valuables which you have brought for his acceptance; let us now, therefore, present him further, each one of us, with a large tripod and a cauldron. We will recoup ourselves by the levy of a general rate; for private individuals cannot be expected to bear the burden of such a handsome present. Odyssey, 13.10-15 [tr. S. Butler] They also were used as dedicatory offerings to the deities, and in the dramatic contests at the Dionysia the victorious choregus (a wealthy citizen who bore the expense of equipping and training the chorus) received a crown and a tripod. He would either dedicate the tripod to some deity or set it upon the top of a marble structure erected in the form of a small circular temple in a street in Athens, called the street of tripods,  from the large number of memorials of this kind. One of these, the Choragic Monument of Lysicrates, erected by him to commemorate his victory in a dramatic contest in 335 BC, still stands. The form of the victory tripod, now missing from the top of the Lysicrates monument, has been rendered variously by scholars since the 18th century. An ancient Greek coin c. 330-300 BC. Laureate head of Apollo (left) and ornate tripod (right). Martin L. West writes that the Pythia at Delphi shows many traits of shamanistic practices, likely inherited or influenced from Central Asian practices. He cites her sitting in a cauldron on a tripod, while making her prophecies, her being in an ecstatic trance state, similar to shamans, and her utterings, unintelligible. According to Herodotus (The Histories, I.144), the victory tripods were not to be taken from the temple sanctuary precinct, but left there as dedications. ^ Eberhard, Wolfram, A History of China, Berkeley and Los Angeles : University of California Press, 3rd edition, 1969. Cf. p.49 for illustration of Ancient bronze tripod found at Anyang. ^ Vase-paintings with the mythic motif begin in Geometric Style, but the identifications of Heracles and Apollo become certain only in the 6th century. (Walter Burkert, Homo Necans (1982) translated by Peter Bing (University of California Press) 1983, p 121, and bibliographical note. ^ Martin Litchfield West, The Orphic Poems, p.147. "The Pythia resembles a shaman at least to the extent that she communicates with her god while in a state of trance, and conveys as much to those present by uttering unintelligible words. It is particularly striking that she sits on a cauldron supported by a tripod. This eccentric perch can hardly be explained except as a symbolic boiling, and, as such, it looks very much like a reminiscence of the initiatory boiling of the shaman translated from hallucinatory experience into concrete visual terms. It was in this same cauldron, probably, that the Titans boiled Dionysus in the version of the story known to Callimachus and Euphorion, and his remains were interred close by". See also Mircea Eliade, Spirit Language. ^ Neer, Richard T. (2012). Greek Art and Archaeology: A new history, c. 2500 - c.150 BCE. New York: Thames & Hudson Inc. p. 100. ISBN 978-0-500-28877-1. West, Martin Litchfield, The Orphic Poems, Oxford, 1983. Benton, Sylvia, "The Evolution of the Tripod-Lebes", The Annual of the British School at Athens, Vol. 35, (1934/1935), pp. 74–130. Wikimedia Commons has media related to Sacrificial tripod.